By Kori ~ May 29th, 2013. Would you like a quick suggestion for a good wine to drink tonight (or this weekend) that wonâ€™t break your budget and is widely available? If so, you might want to check out the 2011 Banfi Rosa Regale Brachetto dâ€™Acqui from the Piedmont region of Italy. In 1979, John and Harry Mariani, owners of Banfi Vintners, acquired a mid-18th century winery, known as Bruzzone, revitalized it, and renamed the facility Vigne Regali. Banfi’s Rosa Regale is created in one of Italyâ€™s smallest production zones, the Brachetto dâ€™Acqui DOCG in Piedmont. Produced with Brachetto grapes grown at the La Rosa Vineyard in the town of Acqui Terme, its label features a single red rose. For those of you who are predominantly white wine drinkers and/or prefer sweet wines, this is certainly a wine you should try. It is a good before or after dinner drink and also pairs well with seafood, cheese, and chocolate. 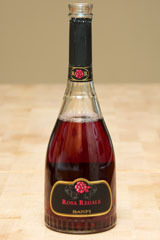 2011 Banfi Rosa Regale Brachetto dâ€™Acqui (Piedmont, Italy): 100% Brachetto. Sweet red sparkling wine. Small, fairly fast bead of bubbles. Medium to deep ruby red. Aromatic with bright red fruit and cherry Jolly Rancher on the nose. More cherry as well as raspberry and strawberry come through on the palate. Sweet but not sickeningly sweet. Medium to full-bodied with lively acidity and a long finish.